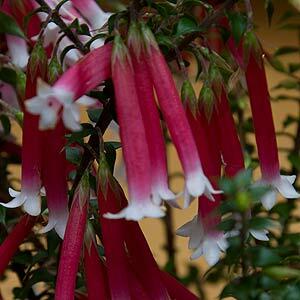 Epacris are found on the east coast of Australia from southern Queensland to Tasmania and across to South Australia. With about 40 species in the genus are generally upright, low growing shrubs from .2m to 2.5m, most under 1.5m. Commonly called heaths, they are related, and are also found in New Zealand. It is mainly the Australian species that have found use as garden plants, colourful flowers and good foliage they come in a variety of forms. 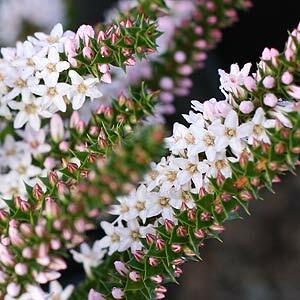 Attractive both to birds and insects Epacris make good garden plants adding colour during the winter months which is always welcome. Known as heaths or Australian heaths and some have tubular flowers so just to confuse things a little E. longifolia (pictured right) is know as the native fuchsia, red flowers tipped with white. E. impressa (bega), has shorter red tubular flowers while E. pulchella, is known as the coral heath, the white flowering form (bottom picture). Use as a rock garden plant or in the garden border. Other Notes – Epacris do not like root disturbance, so do not cultivate around plants. They are difficult to transplant.